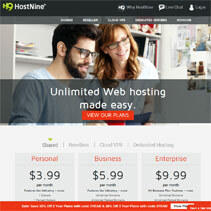 Founded in 2006, HostNine is a sister company to the better-known hosting service “A Small Orange“. Purchased in 2012 by EIG, HostNine web hosting shares the same servers, management team and support system as A Small Orange, however, it offers a far more affordable array of hosting solutions and access to a much greater number of data centers. Best of all, it is consistently rated high for providing rapid, accessible and people-friendly support solutions. HostNine web hosting offers a variety of hosting packages that are capable of meeting a diverse range of needs. This company uses the standard cPanel which makes moving hosts a fast and easy effort should this need ever arise. Subscribers have also access to the Softaculous Installer, which makes the install process for Joomla, WordPress and many other scripts both simple and hassle-free. Those using WordPress will additionally receive full, rolling backup functionality. There is also an impressive upgrade path. This is because HostNine provides access to a number of affordable VPS servers allowing for quick, seamless and cost-effective upgrades as necessary. HostNine currently offers Personal, Business and Enterprise hosting solutions, each of which comes with highly competitive prices. The Personal hosting plan includes one domain, one parked domain, unlimited bandwidth and unlimited storage. Subscribers opting for the Personal plan will only have access to US-based data centers. Business packages come with unlimited domains and unlimited parked domains, unlimited bandwidth and unlimited storage. Subscribers who purchase this package can choose data centers from one of six different countries. When purchasing the Enterprise package, subscribers will get everything that is found in the Business package plus a free domain, free SSL and free priority support. They can also choose from data services located throughout six different countries. HostNine offers options in shared, reseller, cloud VPS and dedicated server hosting. The minimum service term for the Personal plan is six months; however, subscribers can opt to pay month to month by upgrading to the Business plan. It is important to note that while A Small Orange only has data centers in the US, HostNine has data centers in several different countries. With servers located closer to site users, page visitors are certain to have a faster and more appealing experience overall. Like most other hosting services, HostNine web hosting comes with a 99.9% uptime guarantee. HostNine, however, has proven more than able to deliver on this guarantee and even backs its promise up by agreeing to give subscribers a full day of credit for every proven hour of downtime. This company also offers a generous 45-day, money-back guarantee which gives new subscribers the opportunity to test their performance out before making any binding commitments. There are, however, a few, relatively minor drawbacks in working with this company. Foremost among these is the fact that subscribers cannot choose their server location when opting for the most basic hosting plans. Although this should not cause any significant concern among US-based customers, those living elsewhere, such as in the UK, will likely need to upgrade their hosting service in order to get past this issue. Paying a bit more for the business plan that this company supplies gives subscribers outside of the United States the ability to choose their server locations. Finally, HostNine is not as well branded as its sister company and although this has little impact on the quality of services being offered, it has led to a more limited knowledge-base that subscribers can take advantage of. A Small Orange tends to be heavily preferred by the general marketing and management team that these two companies currently share. As a result of this fact, the majority of company blog posts are strictly in reference to A Small Orange. This entry was posted in HostNine. Bookmark the permalink.